do orgasms come in food form? Truly one of the best meals I have eaten in a long time. I walked and walked and walked to find Golden Fields and am so glad I didn’t give up. My only regret is not ordering more but alas, my dining partner abandoned me last minute and there is only so much one girl can order without feeling guilty, especially at Aussie prices. But despite being alone, I did order dessert and OMG . . . we’ll get to that in a minute. 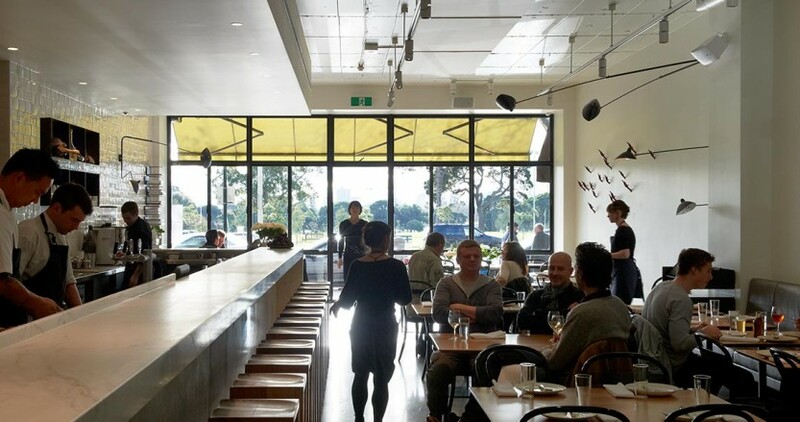 I saddled up to the end of the bar, hung my bags on the aptly supplied hooks, scoured the menu and immediately started drooling over the dishes the girls sitting next to me were eating. When my darling server learned i was alone, he quietly slipped me a small stack of magazines to read. I was instantly smitten. To start, the famous lobster roll ($15). 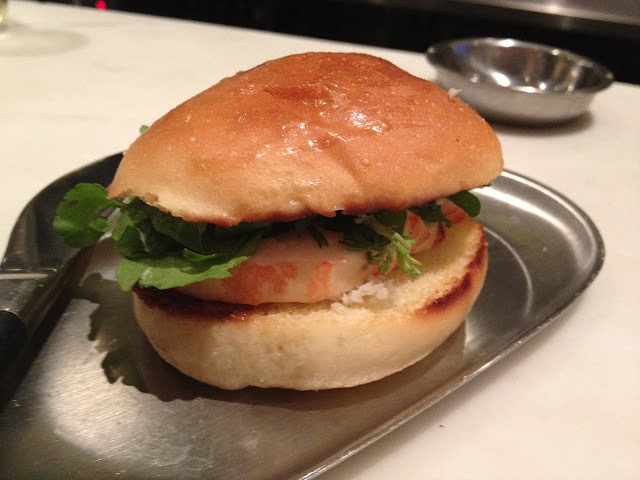 Paired down to a minimal presentation — a small round buttery bun, two thin slices of poached crayfish (lobster), watercress and a smear of kewpie mayonnaise. The combination was amazing in flavor. As an American eating a New England specialty reinterpreted by an Aussie chef, I couldn’t fault the taste or approach but did miss the over abundance of lobster we’re used to up here. 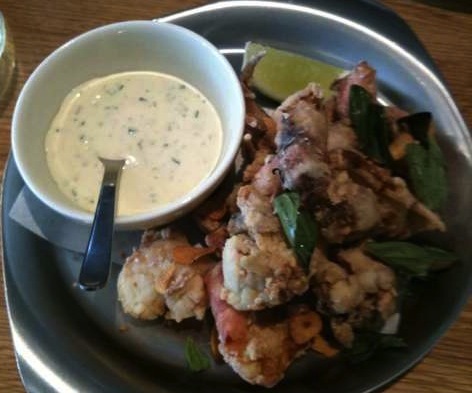 Next, a simple soft shell crab ($21) cooked to perfection accompanied by a fresh lime wedge and magical aioli sauce for dipping. Another nice touch, was how each item was presented and explained by the person from the kitchen who actually prepared the dish. I’m not sure if this was a treat only for those sitting at the bar but it was another unexpected bit of service that made me swoon. My waiter carefully described two different desserts that caught my eye on the menu, noting how different they were. 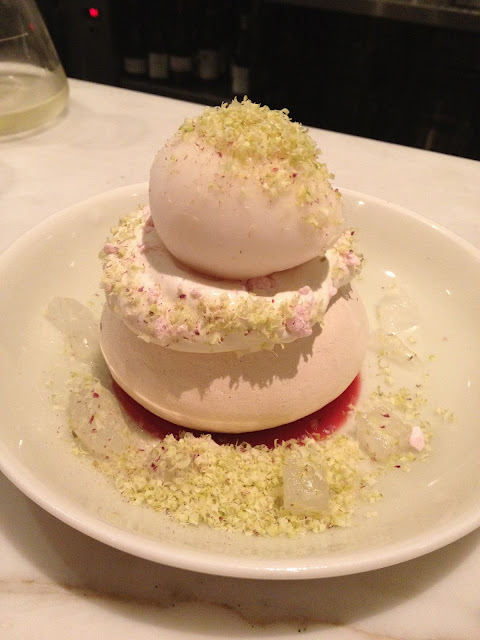 Do I go for the decadent sounding peanut butter, salted caramel and chocolate parfait ($10) that is so popular they haven’t been able to take it off the menu; or the more elegant baked meringue ($15) with raspberry, lime, rose and lychee, layers of cream, sorbet and fruit? I chose the latter and I can unequivocally say, it was the most amazing thing I have ever eaten. EVER! The good of eating alone — no need to share even a bite. The bad of eating alone — no one to share the amazing experience with except of course, the darling waiter who seemed pleased by the smile on my face. This entry was posted in Australia, Food, Restaurant Visits, Travel by mrs. roper's musings. Bookmark the permalink. Loved this review, I very badly want to make this dessert as I live inTassie and can’t get to Golden Fields. Great photos.